Michael Schenker's current band, Temple of Rock release their second album on the 2nd December. 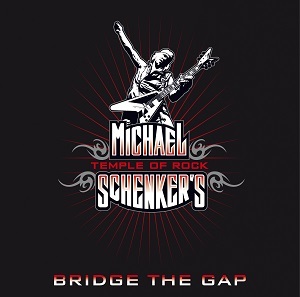 Entitled "Bridge the gap", the album features the lineup that has been touring over the last year or so - Michael Schenker (ex UFO and Scorpions) on guitar, Doogie White (ex Rainbow) on vocals, Francis Buchholz (ex Scorpions) on bass, Herman Rarebell (ex Scorpions) on drums, and Wayne Findlay on 7 string guitar and keyboards. The album was written and recorded during a gap between the two legs of the tour for the last album, and Michael Schenker says that this meant they were able to record the album, tour and then go back for a fresh listen to the album and to make some changes in light of that, before releasing it. How much that process added to it, only the band will know, but one thing that is clear is that this is a superb album. Right from the start of the album with that guitar riff at the beginning of "Neptune rising", I was hooked. I particularly love the Hammond organ during "Rock n roll symphony" with it's 70s sound associated with classic bands such as Deep purple. This is a truly excellent album from Michael Schenker's Temple of Rock. It's got a sound that mixes both modern and classic 70s hard rock. This is an album that I think will stand the test of time - I fully expect to still be listening to it in years to come. This album is Michael Schenker at his best - it's certainly the best album from him in years, with not a single weak song. The album is packed with superb guitar work, well crafted songs and great vocals - if his Temple of Rock band are producing stuff like this for just their second album then the future looks very good indeed. "Bridge the gap" will be released on 2nd December.